Green infrastructure (including low impact development) is a cost effective way to create more resilient, liveable, and walkable cities. Inclusion of green infrastructure in rights of way is a strategy that can help cities in Ontario control rain water onsite, and restore pre-development water balance. Implementing green infrastructure on streets and other public and private sites will also help to address water quality, tree planting, erosion control, and flood control, including reduction in combined sewer overflows. 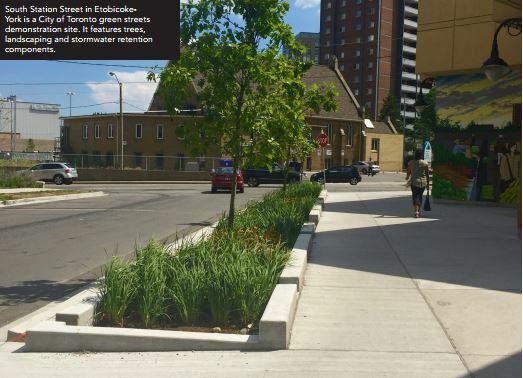 The City of Toronto’s newly released Complete Streets Guidelines incorporate green infrastructure for stormwater management and other benefits as part of the definition of a truly complete street. This integration of inclusive transportation and green infrastructure is truly “joined up thinking”. The guide is filled with photos and explanations that are easy to understand and a recommended read for anyone with an interest in the built environment and creating healthy communities. Chapter 7 – Street Design for Green Infrastructure features green infrastructure elements such as trees and other landscaping, as well as engineered permeable surfaces. 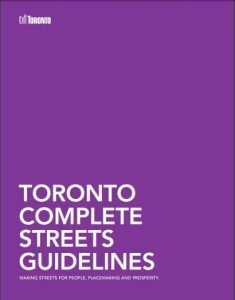 The guide complements Toronto’s forthcoming Green Streets Technical Guidelines which will provide more detailed direction on how to integrate green infrastructure elements into street design.